Quanics Heavy Duty 26” by 18” diameter rotational molded basin, 26” lid, gasket pack, and security screws. Inline quick disconnect shut-off and quick disconnect on outgoing lines. 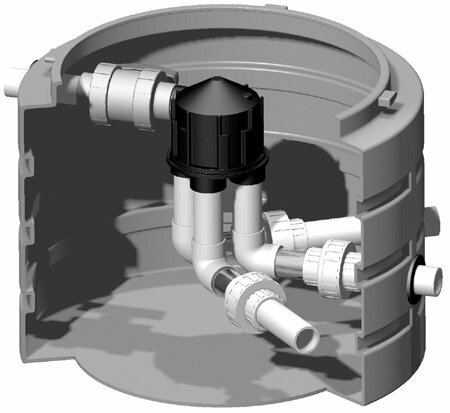 K-RAIN 6000 Series Indexing Valve - Valves: Easy to install and maintain, K-Rain's patented hydraulic actuated indexing valve changes zones when the water flow is interrupted. These valves are ideal on pump applications, onsite waste water disposal and reclaimed water systems. Metal Die-Cast Body – Durable, long lasting and capable of high pressure applications. Operates at 15 GPM (57 LPM) at Pressures of 25–150 PSI (1,7-10,3 bar). Built-in Atmospheric Vacuum Breaker - Releases any vacuum created between the pump and the valve on shut down.